Last week I had the opportunity to speak to both current and aspiring innkeepers at the Bed and Breakfast Innkeepers of Colorado Conference on “Energizing the Breakfast Experience”. We all know that at a Bed and Breakfast Inn the breakfast experience is of key importance to our guests. Some of the things we discussed were how we seat our guests at breakfast. We at Rocky Mountain Lodge & Cabins serve breakfast to the guests in our dining room at one long table where the guests can interact with each other and enjoy each other’s company and get to know each other. Guests that stay in our Cascade Suite can have their breakfast served to them in-suite, providing a quiet, romantic breakfast just for the two of them. Some B&B’s have small, individual tables to serve their guests. We also talked about the way we serve our guests. We serve plated, 3-course breakfasts to our guests. Some inns offer continental style breakfasts, or family style breakfasts. And of great importance, WHAT we serve for breakfast. We like to serve foods you don’t have for breakfast every day at home. We like to think when you’re on vacation, you should be treated special and breakfast should be a new adventure, along with the other activities you’ll be enjoying while visiting Colorado Springs and the Pikes Peak area. We come up with unique, gourmet, signature dishes that we hope will tantalize our guests’ taste buds, and do not believe on skimping on quantity, or quality, of foods. Our 3-course breakfasts consist of a fruit course, a main entree, which rotates from a bread dish one day (french toasts, waffles, pancakes, or stratas, etc), to an egg dish the next day (omelets, quiches, frittatas, etc), and we always end with a breakfast dessert; yes, dessert for breakfast. Breakfast is a main event at our inn, and will often hold you over until nearly dinner time. You can see pictures and some menus on our breakfast page. 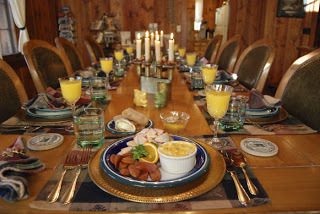 Other innkeepers may prepare a continental, or cook to order breakfast for you. And most inns, including us here at Rocky Mountain Lodge & Cabins, will cater to dietary restrictions such as vegetarians, gluten-free, diabetic, etc. We also talked about the recipes we use at our inns. Often we have signature and special dishes that our guests want to take home with them and recreate and share with their friends and family. We discussed ways to promote and share our recipes. We have a Recipes page on our website where we share a Recipe of the Month, and more recipes can be found on our blog, and in our newsletters (sign up to receive our newsletters). After much urging from our guests we have written our own cookbook, “Rocky Mountain Lodge & Cabins’ Favorite Recipes”, which includes 349 of the recipes we have been cooking for many years, including appetizers & beverages, soups & salads, main entrees which includes breakfast foods, dinner entrees and lunch dishes, vegetables & sides, which include our fruit dishes, breads and rolls, desserts, cookies & candies, and other delectable goodies. You can purchase our cookbook from our gift shop. Overall, it was a good session and we were able to share and exchange ideas and learn more ways from each other to Energize the Breakfast Experience. Come stay with us here in our Colorado Bed and Breakfast Inn and let us share our gourmet breakfasts with you!